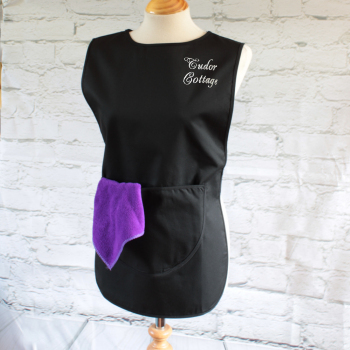 Personalised cotton tabard with front pocket that can be embroidered with a name or business name or logo great for those in catering, hosting, childcare or salons. Personalised cotton tabard with front pocket that can be embroidered with a name or business name or logo great for those in catering, hosting, childcare or salons. Have your name, initials, nickname or company name embroidered in your choice of colour and font style across the top left. Makes a unqiue and useful gift or stylish workwear for yourself and employees. This tabard is made from 65% polyester for easy care and 35% cotton for durability and comfort. Fully pre-shrunk fabric fade resistant and machine washable. Snaps for adjustable fitting on side tabs. UK Sizes: Sm 32/34" Med 36/38" Lg 40/42" XL 44/46" 2XL 48/50" inches across the chest. Approx tabard length 68cm. Please allow approx 3 days for your customised tabbard to be dispatched.